DOJ Set To Block AT&T Takeover Of Time Warner : The Two-Way The Justice Department has informed AT&T that it will oppose the company's planned $85 billion merger unless it sells off CNN — a network frequently derided by President Trump. 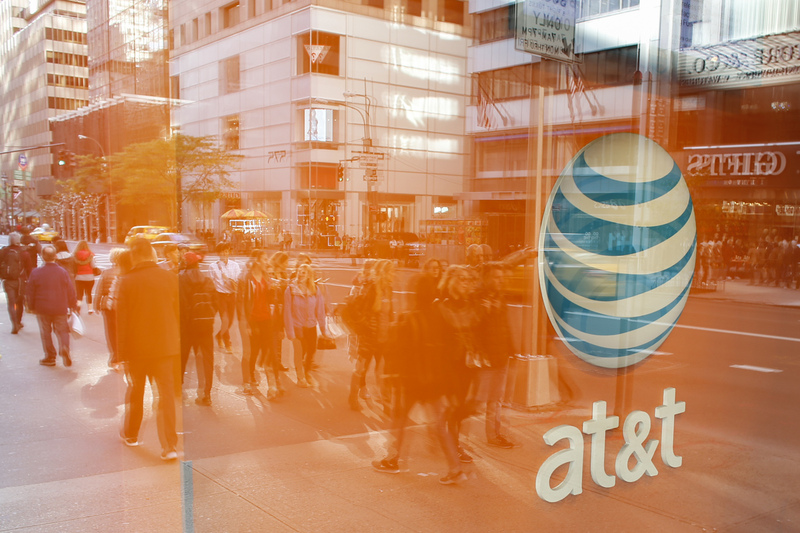 An AT&T storefront on Fifth Avenue in New York. The Justice Department may require the company to sell CNN as part of a proposed takeover of Time Warner. The government's stance seemingly flies in the face of decades of precedent: Federal authorities routinely approve deals involving so-called vertical integration — the consolidation of companies in related fields that are not competitors. And it contradicts the current federal antitrust chief's past statements a year ago after this deal was announced. The government's position was first reported by the Financial Times. NPR confirmed the development in interviews with three people with knowledge of negotiations with the government who spoke on condition of anonymity because they were not authorized to speak about the deal. Justice Department antitrust officials offered AT&T a choice to keep the deal alive: Get rid of Time Warner's Turner Broadcasting division, which includes CNN, or dispose of DirecTV, AT&T's giant satellite television provider. But the sticking point appears to have been CNN, according to two informed sources at Turner Broadcasting. "I am just frankly mystified by the rationale here," said University of Pennsylvania law professor Herbert Hovenkamp, a leading authority on antitrust issues. "You need to know where competitive harm is threatened. So far, I don't see it." Trump previously indicated he might seek to thwart the AT&T-Time Warner deal over antitrust concerns. Yet Trump has been far more vocal about his anger at CNN — both as a candidate and as president. For example, earlier this year, at a formal press conference in Poland with that nation's president, Trump said, "They have been fake news for a long time. They have been covering me in a dishonest way." As a result, within Time Warner, the Trump administration's stance is being seen as a direct strike against CNN. "There isn't any precedent," says one executive at Turner Broadcasting, the television subsidiary that would have to be sold off. "It's one thing to say, 'Fake news'! It's another to reverse governmental policy because you object to a company's journalism." AT&T Chairman and CEO Randall Stephenson said Wednesday the company never offered to sell CNN and has no intention of doing so to win approval of the Time Warner deal. The Justice Department would not confirm its stance, saying it does not discuss matters under review. Federal regulators are separately reviewing Sinclair Broadcasting's proposed acquisition of Tribune Media, which would give it control of more than 200 stations nationally. And John Malone's Discovery Communications is in the process of acquiring Scripps Network Interactive Inc., which would combine two families of cable networks. Those deals are "horizontal integration" — the blending of competitors — which is usually given far rougher scrutiny. Yet the concessions demanded by the federal government for the AT&T package are significantly greater than those expected to face the Sinclair or Discovery deals. Indeed, the Federal Communications Commission changed regulations that make it easier to approve the deal for Sinclair, a conservative chain of local stations that has emerged with coverage and commentaries supportive of the president. "The one reason that doesn't fly for blocking the deal is, 'Don't approve it because it's CNN, and CNN annoys the president,' " said Craig Aaron, president and CEO of the consumer advocacy group Free Press. "It's legitimate for the federal government to say this is just too big. The only question is: Is this legal reasoning? And I think there's an antitrust case to make there." "If the reason that's coming down is, 'Punish CNN,' then that's a real problem," Aaron told NPR. "We don't really know, and because of everything Trump has said, you can't help but ask the question." The head of the department's antitrust division is Makan Delrahim, who served as deputy to the antitrust chief under President George W. Bush. That Justice Department blocked a small number of horizontal integration deals blending competitors — such as the thwarted merger of US Airways and United. Republican administrations are typically even less willing to intervene in corporate actions. In an interview with a Canadian television network when it was proposed, Delrahim discouraged talk that the AT&T-Time Warner deal would be a tough sell. "Just the sheer size of it and the fact that it's media I think will get a lot of attention," Delrahim told BNN in October 2016. "However, I don't see this as a major antitrust problem." AT&T has signaled that it intends to challenge the administration in court over the requirement.